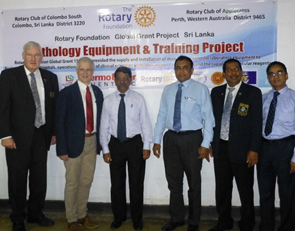 The Rotary Club of Applecross Inc, and the Rotary Club of Colombo South submitted an application for a Global Grant project to provide Pathology Laboratory Equipment & Training in some hospitals in Sri Lanka. 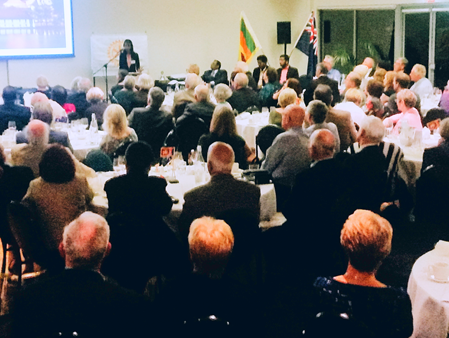 The project was initiated by agreement with the District Governor of D3220 (Sri Lanka) and District Governor Melodie Kevan D9465 (Western Australia). The Project was approved by the Rotary Foundation on 5 February 2016. Applecross Rotary Project Team Members were Professor Tim Inglis, Dr Barry Mendelawitz and PDG John Kevan. 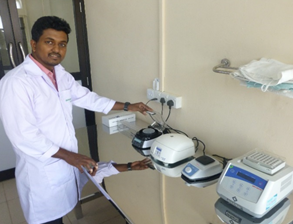 The Project undertook to provide equipment and training to hospitals and staff in Sri Lanka, to enable them to test for infectious diseases in a rapid and timely manner and thus direct appropriate treatment. This vital public health initiative will save lives and reduce suffering. Training and sustainable support are key components of the plan. The budget for this project was USD 206,740, and was funded by Rotary Clubs, Rotary Districts, co-operating organisations and private donations. 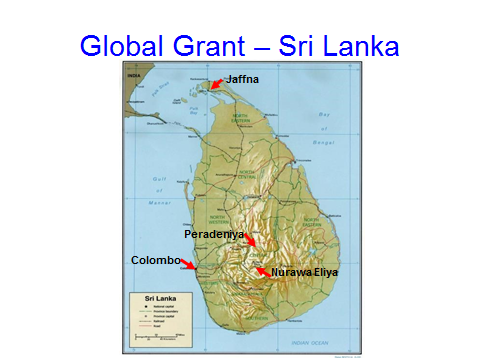 The Government of Sri Lanka, through the Ministry of Health and, the Ministry of Education, and the University of Peradeniya have been specifically consulted on all aspects of this project. The training took place at the University of Peradeniya from 15 – 18 June. The co-operating organisation is Co-operating Organisation: Lab Without Walls Inc. (LWW). 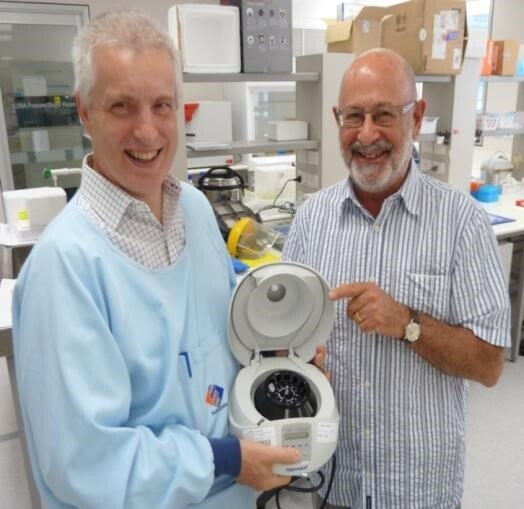 This Australian NGO is a not-for-profit organisation that provides disease detection equipment advice for remote and underdeveloped regions. LWW also provides specialist microbiological training for hospital staff. Key aspects of sustainability for this project were considered. 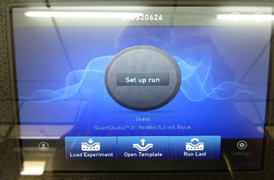 The provision of reliable equipment. Proven laboratory items and facilities that have maintenance support and appropriate spare parts available. The provision of trained laboratory technicians to operate the equipment and complete the documentation and recording. 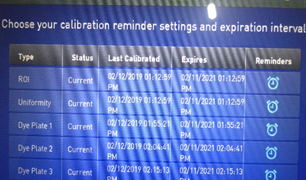 The ability to measure existing levels of disease cases and maintain full records of the new testing regimes. The ability to evaluate the data to assess the correct diseases are being targeted and treated. 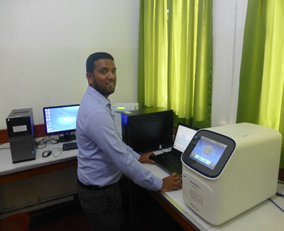 The Project provided equipment and training to hospitals and staff in Sri Lanka, to enable them to test for infectious diseases in a rapid and timely manner and thus direct appropriate treatment. This vital public health initiative will save lives and reduce suffering. Training and sustainable support are key components of the plan. The budget for this project was approx. $275,000 funded by Rotary Clubs, Rotary Districts, co-operating organisations and private donations. The Government of Sri Lanka, through the Ministry of Health, and the University of Peradeniya were specifically consulted on all aspects of this project. 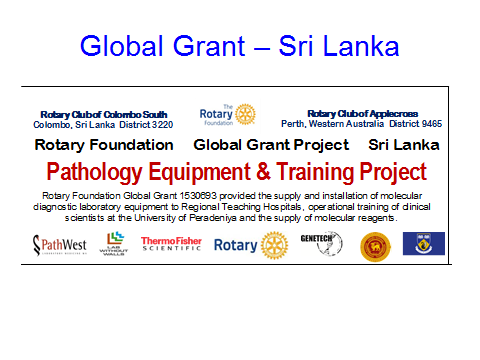 The USD207,640 Global Grant was awarded to the Rotary Club of Applecross and the Rotary Club of Colombo South in February 2016, to provide equipment for rapid testing of infectious diseases, installed at hospitals in Jaffna and Nuwara Eliya. 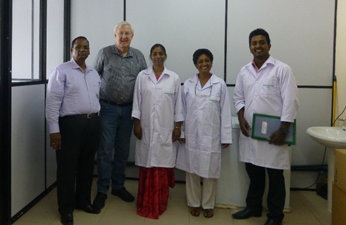 All equipment was purchased and delivered to the Jaffna Teaching Hospital and the University of Peradeniya. Following the training which took place from 15 – 18 June at the university that equipment was delivered to the Regional Hospital Newara Aliya. The cooperating organisation was Lab without Walls Inc. (LWW) This Australian NGO is a not-for-profit organisation that provides disease detection equipment advice for remote and underdeveloped regions. 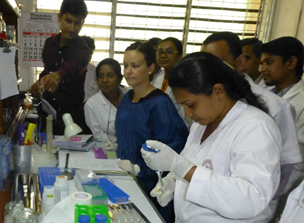 LWW also provides specialist microbiological training for hospital staff. Provision of an agreement for ongoing supply of reagents to ensure sustainability of the project. 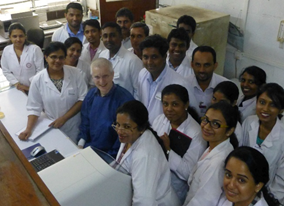 A Training team from Perth consisting of PDG John Kevan, Dr Tim Inglis and Elin Turnbull visited Sri Lanka 12 – 22 June to meet with the host Rotary Club of Colombo South, equipment suppliers, the Ministry of Health and also manage and provide the four day intensive training program for twenty two clinical scientists at the University of Peradeniya. As a consequence of the success of this project, District Governor Melodie Kevan initiated a Rotary Vocational Training Team initiative. 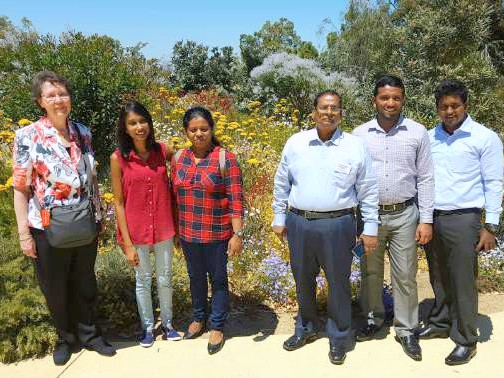 Four of the participants from the training program were selected to come to Western Australia on 1- 21 November 2016, for additional clinical scientist training at PathWest Medical Laboratories, organised by Dr Tim Inglis. The Team members were hosted by Rotarian families from six Rotary Clubs including the Rotary Club of Applecross during their stay. Dr Tim Inglis and participants in the Training Workshop. Vice Chancellor, Dean and senior staff of the University of Peradeniya, with PDG John Kevan and Dr Tim Inglis at the opening of the Training Workshop. Elin Turnbull with participants observing a testing result. Team Members plus reserve and Team Leader. M Anfas, MLT. Other staff available. 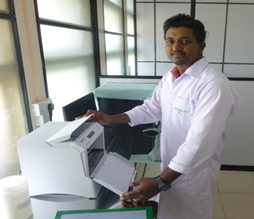 M Anfas operating the PCR equipment. Ready to receive specimens from Newara Eliya and nearby hospitals. 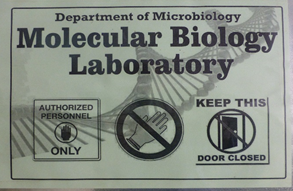 Peradeniya Laboratory is fully airconditioned, dust free and secure. Noisy friend watching outside the Laboratory. 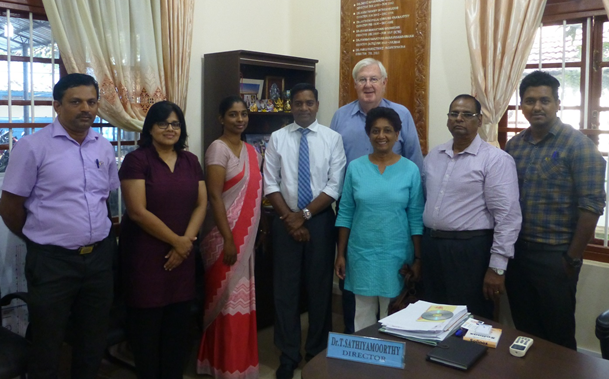 Meeting the Director Teaching Hospital Jaffna. L to R. S. Sureshlumen, Microbiology Laboratory Technician (MLT), Dr Nasmiya Mubarak, past Consulting Microbiologist, Dr Rajanthi Ramachandran, now Consulting Microbiologist, Dr T Sathiyamoorthy, Director THJ, Rotarian PDG John Kevan, Dr Enoka Corea, University of Colombo, Rotarian PP Nadaraja Saravanapavan, Mark Mithulan, MLT. 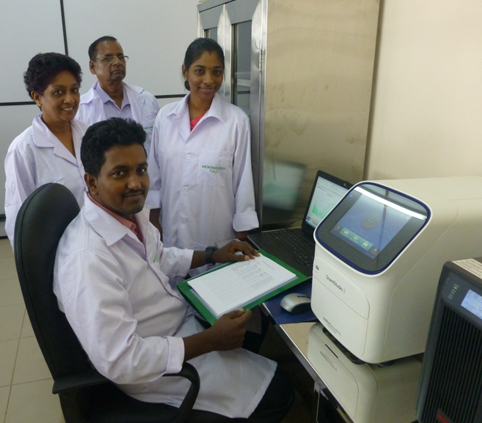 The TH Jaffna Project Team meeting in the refurbished Microbiology Laboratory. Note freezer. 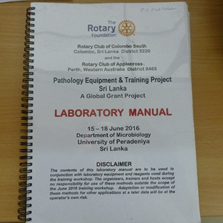 Laboratory Manual provided by Rotary at workshops. 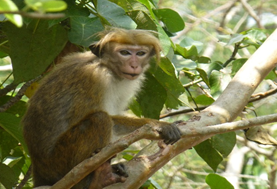 TH Jaffna Laboratory. Reviewing PCR equipment in operation. 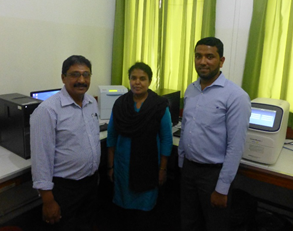 RC Colombo South, Dr Rajanthi Ramachandran, now Consulting Microbiologist. In chair. Mark Mithulan, Microbiology Laboratory Technician.